Sambar onions (tiny purple shallots that you get in India) are absolutely perfect for this sambar because they are small enough to go in whole. The shallots I get here are enormous in comparison, and I usually have to chop them in half when I make this sambar. Ordinary onions can be used too, and with great results. But - and I speak for myself - it is the sambar onions that make this dish what it is... and they also bring back memories of those "special" days when my mother would make arachuvitta sambar paired with hot roasted baby potatoes and plain white rice. She didnt make it as often as she was asked, because peeling those pesky little onions was a finicky, annoying, time-consuming job that left you with smelly fingers for ages. Despite that, it was a job I took on gladly. The end result was so worth it! I dont have any photos for this (bar the masala ingredients) because my camera battery gave up just then. But since no camera can capture the aroma of this sambar, which is its real essence, I guess it doesnt really matter. This sambar can of course accommodate any combination of most vegetables, so you dont have to stick to just onions. I like to throw in a handful of frozen green peas once the other vegetables are cooked. Peas dont take long to cook at all, and if you drop them in with the other veg, they go grey and mushy by the end. If you add them towards the end of cooking, they stay fresh and green. 1. Dry-roast the coconut masala ingredients (bar the coconut itself) till the coriander seeds turn a darker shade. 2. Cool, then grind along with the grated coconut to a smooth, thick, pourable paste, using a little warm water (5-6 tbsp). Set aside. 3. In a pan, heat the oil and add the asafoetida powder if using, the mustard seeds and curry leaves. Close the pan until the mustard seeds finish popping. 4. Add the sliced onions/baby shallots to the pan and stir fry for two minutes, then add the tamarind water. 5. Bring it to a rolling boil on high, then turn down the heat to medium and let it bubble gently until the onions turn translucent (or the vegetables are cooked). (Add the frozen green peas now, if using). 6. Add the ground coconut masala and cooked tuvar dal, mix well. Add salt to taste. Let the mixture boil gently for 5 minutes. It should not be watery. If the sambar seems too watery, remove some of the liquid from it (making sure to leave out the vegetables!) and dissolve some rice flour or corn flour. Add it back to the sambar and let it bubble for a couple more minutes. 7. Garnish with chopped fresh coriander leaves and serve hot over plain rice, with any vegetable dish. I was smiling when I read the post. I totally agree that the aroma of this sambar is amazing. This is my hubby's favorite although I am lazy to make this too often because of the peeling involved. It tastes fantastic with curd rice, a true tamil delight. Nice recipe, but dont you have to use toor dhal as well? I usually add cooked toor dhal to the onion/tamarind mixture before adding the ground masala. shammi, ahh arachu vitta chinna vengaya sambar. It was a treat reserved only for special occasions and special guests!! Here in the US, I get red pearl onions that are a reasonable substitute. I have even used frozen pearl onions in cases of culinary emergencies. Anonymous - thank you for pointing out the omission of the cooked tuvar dal! I kept thinking there was something missing from the recipe but couldnt put my finger on the item. Thank you for noticing! This is exactly the recipe my mom write down for me when I was going to switzerland. Now I can make it without referring... brings back memories though!! TO peel the small onion I usually drop them in warm water for 3 or 4 min. This method works very well. The skin of the small onion just peels away easily. Don't you have to add turmeric powder while cooking the toor dal? My tamil roommate in college used to make this for special occasions - I missed it so much and made it from your recipe yesterday. The result was AWESOME, my bengali husband polished it off too!!! Onion sambar!! aaahh.. mouth watering as I think of its taste. 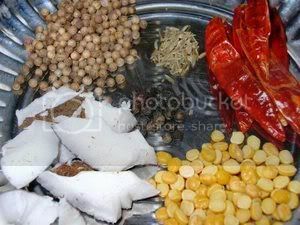 all these days I was putting thuvaram paruppu in the masala. will try with kadala paruppu next time. Thanks for posting. I followed the instructions perfectly but for the bit about the tamarind - I have only the full tamarind and I think I soaked too much of it :-(. The sambar came out slightly sour but still tastes pretty good. Any idea about how much tamarind should be soaked - so I get it perfectly right the next time round? Thank you!